NETWORK FINALS: The AFC CHAMPIONSHIP game adjusted to 16.3. In addition, CHARMED lost 0.1 in final numbers. CABLE HIGHLIGHTS: Adult Swim’s TIGTONE led scripted at 0.34/0.28, compared to last week’s 0.31/0.28. On HBO, TRUE DETECTIVE was at 0.29 compared to last week’s 0.48/0.33, and on the season premiere front, CRASHING was at 0.10 compared to its 0.14 2018 season finale, and HIGH MAINTENANCE was at 0.06 compared to its last finale’s 0.11 (on a Friday). 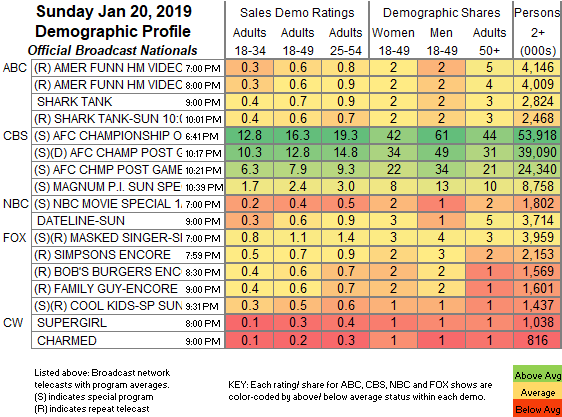 On Showtime, SHAMELESS returned for the back half of its season at 0.26, down 0.07 from its midseason finale, with the premiere of BLACK MONDAY at 0.08 and SMILF’s season premiere at 0.06 compared to its 0.10 Season 1 finale (which aired on New Year’s Eve 2017). Note that both of those had been available previously on VOD/streaming. On Starz, OUTLANDER rose 0.03 to 0.24, and COUNTERPART returned from a week off at 0.08. NatGeo’s VALLEY OF THE BOOM fell to 0.05/0.05 from last week’s 0.13/0.10. Unscripted seemed to be far more affected by the broadcast AFC CHAMPIONSHIP game, led by Bravo’s REAL HOUSEWIVES OF ATLANTA, down 0.21 to 0.66. On TLC, SISTER WIVES returned at 0.40, with SEEKING SISTER WIFE at 0.29. 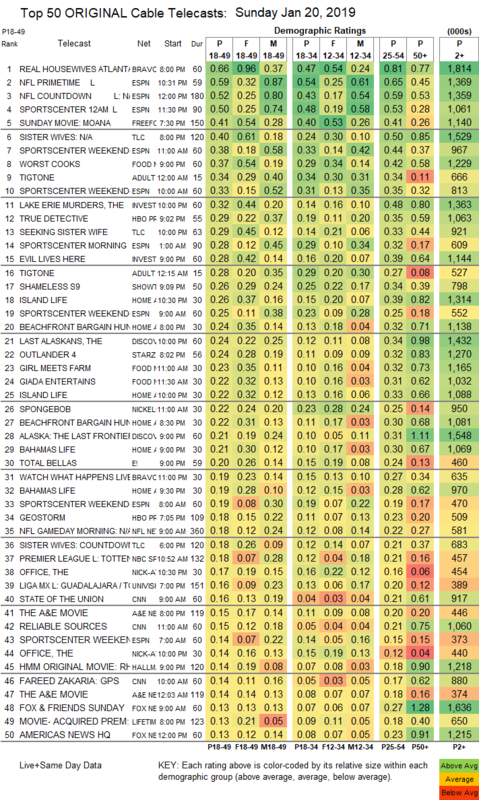 Food Network’s WORST COOKS IN AMERICA fell 0.21 to 0.37. ID’s LAKE ERIE MURDERS slipped 0.02 to 0.32, and EVIL LIVES HERE was down 0.04 to 0.28. HGTV’s line-up was led by ISLAND LIFE at 0.26/0.22, compared to last week’s 0.34/0.29. On Discovery, THE LAST ALASKANS was steady at 0.24, and ALASKA: THE LAST FRONTIER was down 0.09 to 0.21. E!’s TOTAL BELLAS lost 0.03 to 0.20.